Barking Beauties has been in business since 2004. We take pride in our services provided and have always tried to make our customer, the pet and owner, our number one priority by providing outstanding services. To provide high quality, outstanding services, with emphasis on safety, cleanliness and dependability. We try to provide the highest quality service, products and customer service around. Safety of your pet is first and foremost. All grooms will be evaluated each time for the pets best interest. All changes in the pets physical being are always noted in their files and reviewed at each groom and updated so we can keep the owner informed of their pets changing needs. By doing this we have successfully found cancer's and infections in pets as well as dental issues, tumors, warts and dermititis'. The customer is always advised when a vet visit is recommended. *Please note: we are not vets and all recommendations are just that. They are not a diagnosis. Only your vet can diagnosis your pet. Customer Service is key. We are a small and personable business. We try to get to know all of our customers, as well as their likes and dislikes. We will try our best to accomodate your needs as best as possible. Cancellations are far and few, but unfortunately, they happen due to weather, van maintenance issues and sickness. The customer will always be informed if something comes up and a groom appointment can not be met. No customer will ever be standing there waiting for a groomer that never shows. That's a promise. Dependability. We try to make sure that we are always within a 1/2 hour of the schedule groom time. If for some reason we are running really early or late, you will always receive a phone call informing you within that 1/2 hour window. Over the years our customers have become like family. We are always willing to go a step above. Over the years, we have prided ourselves on helping out our customers, community, friends and family. We would like to share some of our special situations. Multiple pets. We will always accomodate multiple pets by having a groomer's assistant at the groom. No groom will be performed on a pet that is too stressful. Their is no amount of money worth jepordizing a pets safety. We are always watching for signs in the pets demeanor, eyes and actions. All calls are evaluated and sometimes a groom needs to be turned down for the pets best interest. We will always explain why. Our sister company K9 Cab is always available to assist our customers with daycare and boarding drop offs and pick ups, vet appoinments for wellness checks, emergency visits and for final goodbyes. We will be more than happy to arrange transportation for your pet based on you and your pets needs. We will always help a customer try and locate a family for a pet in need. Due to many reasons, if an owner needs to find a home for their pet, we have a wonderful network of customers, friends, vets and family to help with the process. Same goes if you are looking for a pet yourself. We always try to get involved. We are proud participants in various parades throughout the year, supplying candy for the kids and dog bones for the pups , as well as donating our time at various shelters, grooming and maintaining the pets for adoption, as well as monetary donations to various organizations that we support throughout the year. We are always promoting volunteering at local shelters. They always need our help, both volunteering and monetary help. 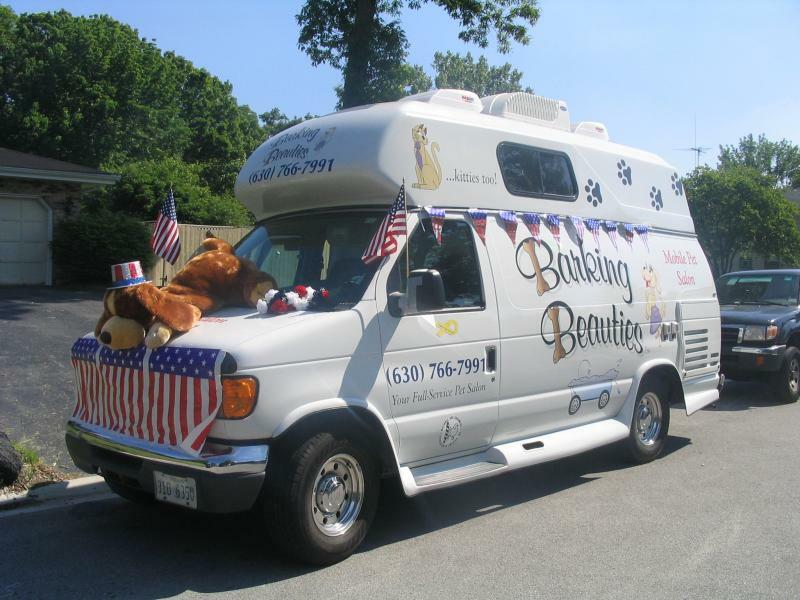 Copyright 2010 Barking Beauties Mobile Pet Grooming. All rights reserved.